Government of the United States of America, et al., Respondents. 1) Is the issuance, and support on appeal, of a court order without a "reasonable probable cause" a judicial act? 2) Is there a non-exigent exception to the XIV Amendment? 3) Is the 15 years struggle as described by the scandalous and criminal acts in this petition probable cause for the Racketeer Influenced and Corrupt Organizations Act (RICO)? This petition started in the U.S. District Court for the Eastern District of Missouri - St. Louis (4: 17-cv-02690-AGF) and The Eighth Circuit (17-3681). The final order from Eastern District of Missouri - St. Louis was issued Thursday, November 09, 2017. The final order from The Eighth Circuit was issued Wednesday, May 30, 2018, their mandate was issued Wednesday, July 25, 2018 (see appendix). Petitioner has been through the Federal Courts District, Circuit and Supreme Court with seven prior Petitions for Writ of Certiorari 07-11115, 11-8211, 13-7030, 13-5193, 14-5551, 14-10088 and 15-8884. All prior petitions, via this reference, are included herewith. This is both a "Federal question" as a violation of my constitutional rights and NOW a "Diversity of citizenship" with the Article III Federal Courts in Washington DC in question. · Rule 60(d)(3) of the Federal Rules of Civil Procedure - "set aside a judgment for fraud on the court"
· 28 U.S. Code § 1331 - Federal Question: Federal question: "The district courts shall have original jurisdiction of all civil actions arising under the Constitution, laws, or treaties of the United States." ADDITIONALLY, I again cite the jurisdiction of the pursuit of Justice and the Constitution for the United States of America with a representative 7th Amendment Jury DEMAND. The idea of issuing and/or sustaining an ex parte order of protection without reasonable probable cause based exclusively on an alleged - unrelated subject-matter - misdemeanor traffic issue is beyond the reach of all reasonable jurisdiction. The utter absurdity of the facts in this case, from its very inception, have begged all credulity. IT IS UNPRECEDENTED. All attempts at covering this up with sovereign, judicial or other immunity are constitutionally unsustainable! This was the act of a vulgar, criminally shameless conspiracy to, 15 years ago, take the petitioner's son, home and all his life's possessions to satiate the conspirator's thirst for power and profit. · "sufficiently clear that every reasonable official would have understood that what he is doing violates that right" (Anderson v. Creighton, 483 U. S. 635, 640 (1987), Ashcroft v. al-Kidd, 563 U. S. 731, 741 (2011)). · THE GRAVITAS OF THE PERSONAL ISSUE IS BEYOND QUESTION, IT TOOK AWAY PETITIONER'S SON, HOME, CAR AND EVERYTHING HE ONCE HELD DEAR IN THE WORLD. Thus the issue could never be construed as a vexatious nor is the ongoing fight against flagrant injustice "continual Calumniations" nor could a 15 year struggle against injustice be construed as an inconsequential "short ride." While the "Jane Crow" proponents of the current domestic relations court want to assert that men have always been the ones to leave, I object. I demand "due process" and "equal protection of the law" before I relinquish my constitutional paternity, property and liberty rights. · On November 3, 2003 Judge Joseph A. Goeke III clearly had no "subject matter" jurisdiction for the statute's stated "subject matter," i.e., "An immediate and present danger of domestic violence." · On November 3, 2003 Judge Joseph A. Goeke III ruled ex parte, by definition, without personal jurisdiction of the petitioner. And the referenced alleged misdemeanor traffic violation, was already under the BONDED personal jurisdiction of another judge, Associate Circuit Judge Jack A. Bennett of 26th District of Missouri. Petitioner was ultimately found to be innocent in due course at a jury trial of the then prior driving while suspended. · On November 3, 2003 Judge Joseph A. Goeke III ruled ex parte, by definition, without geographic jurisdiction of the petitioner. Judge Joseph A. Goeke III was a part of the 21st District of Missouri in St. Louis County some 170 miles away from the site of the alleged BONDED misdemeanor traffic violation and Associate Circuit Judge Jack A. Bennett in the 26th District of Missouri, Osage Beach, Camden County Missouri. Petitioner was ultimately found to be innocent in due course at a jury trial of the then prior driving while suspended. Now before you start crying about my asserting the Supreme Court as "extra-judicial (coram non judice)" and therefore trying to render my entire petition moot, whoa up. If the Judiciary, is only half, as honorable as they assert? They, from the Supreme Court to the lowliest family commissioner, should have ALWAYS been able to honorably admit error and then WORK to remedy their errors! These issues of "due process" and "equal protection of the laws, have been before every Judge that ever heard the case. Starting with my attorney of record, Timothy Schlesinger, at the hearing on November 20, 2003 and in his two timely post-trial motions, noting Missouri Court Rule 129.11 requirements. I am suing for "fraud on the court by an officer of the court" and the resultant damages from the unconstitutional extra-judicial (coram non judice) criminal deprivation of rights. This is consistent with and sustaining the Constitutional necessity - the ex industria laws, originally passed in 1871 - at present codified into Federal Statute laws as 42 U.S. Code § 1983&1985 - Conspiracy to interfere with civil rights - that were Federally legislated post-civil war to enforce this prohibition for all time and without non-exigent restriction. "This robe doesn't make me anything other than human," Judge T.S. Ellis III in the case of ex-Trump campaign chairperson Paul Manafort. The Petitioner's 15 year struggle, with proof of the flagrant deprivation of his Constitutional civil rights in-hand, inculpates all those who have thus sustained the ongoing extra-judicial (coram non judice) deprivation of his rights, in his many appeals. This is and has been, since day one November 3, 2003, a deliberate and unquestionable fraud on the court by an officer(s) of the court. Given the gravitas of the personal issue to the petitioner - the kidnapping of his son and theft of the petitioner's car, home and all his worldly possessions – this is not vexatious or calumnious or a "short ride.". Petitioner is merely asking for his right to relief from injustice, per Rule 60(d)(3) of the Federal Rules of Civil Procedure - "set aside a judgment for fraud on the court" and damages, fraus omnia corrumpit. THERE WAS A COMPLETE ABSENCE OF JURISDICTION for the stated charge and that the court acted extra-judicial (coram non judice) without clear and reasonable probable cause was and is an ongoing "fraud on the court." The ex parte order was issued without probable cause for the stated charge - it was a criminal conspiracy against rights that resulted in criminal kidnaping, assault, trespass and theft. The petitioner was and is the victim of a criminal conspiracy against rights resulting in criminal kidnapping, assault, trespass and theft. The ex parte order at the inception of the issue was, and has ALWAYS been, a "fraud on the court by an officer(s) of the court" and there for not a judicial act, coram non judice. The ex parte order was issued without probable cause for the stated charge - it was a criminal conspiracy against rights – criminal kidnapping, assault, trespass and theft. If the court is immune and not limited by reckonable and reasonable probable cause; JUSTICE CANNOT BE SERVED. Officers of the court could at will arrest anyone to SMEAR for minor issues and THEN charge AND CONVICT capital crimes, on said misdemeanor issues alone; it is too ABSURD to even consider. Did we not learn this with Jim Crow laws? Jane Crow should never have had a foot-hold. Who would ever have democratically authorized a state sponsored "star chamber" to "at will" take away due process protections for paternal rights, property rights and personal liberty rights without exigency? "Unfortunately, loose procedures, high-handed methods and crowded court calendars, either singly or in combination, all too often, have resulted in depriving some juveniles of fundamental rights that have resulted in a denial of due process." Failure to observe the fundamental requirements of due process has resulted in instances, which might have been avoided, of unfairness to individuals and inadequate or inaccurate findings of fact and unfortunate prescriptions of remedy. Due process of law is the primary and indispensable foundation of individual freedom. It is the basic and essential term in the social compact which defines the rights of the individual and delimits the powers which the state may exercise. As Mr. Justice Frankfurter has said: "The history of American freedom is, in no small measure, the history of procedure." But, in addition, the procedural rules which have been fashioned from the generality of due process are our best instruments for the distillation and evaluation of essential facts from the conflicting welter of data that life and our adversary methods present. It is these instruments of due process which enhance the possibility that truth will emerge from the confrontation of opposing versions and conflicting data. "Procedure is to law what scientific method' is to science." (In re Gault, 387 U.S. 1 (1967) internal footnotes omitted)"
The petitioner is asking for R.I.C.O. damages for the 15 years of the criminal deprivation of paternal, personal and property right in the pain and suffering still ongoing in the criminal action. I argued from day one this was a case involving "unreasonable probable cause." To any EDUCATED legal professional, that should infer a constitutional problem described as a "fraud on the court by an officer of the court." Petitioner may not have had the legal shibboleth i.e., "fraud on the court by an officer of the court" but the constitutional issue has always been clear! Petitioner includes the undisputed evidence, the original ex parte order (see appendix), dated November 3, 2003, and by reference the motion stating the facts at issue, prepared by Tim Schlesinger- Respondent's attorney, dated December 5, 2003 - arbitrarily denied extra-judicially (coram non judice) December 18, 2003, without any findings required by Missouri Court Rule 129.11. "NO ONE IS ABOVE THE LAW" is in common usage today in regard to our current president. Petitioner asserts, the larger problem is in our Judiciary. If the Judiciary is as honorable as they assert? They, from the Supreme Court to the lowliest family commissioner, should be able to honorably admit human error and then WORK to fully remedy their human errors! This is how it was always supposed to have worked. Nobody ever assumed that "perfection" would exist - the second the Constitution was enacted and then last happily ever after for all time in the courts. We have forgotten that the founders had many contemporary grievances with the corruption of the judiciary of their time. The Star Chamber, The Inquisition, the Bloody Assizes, or the application of General Warrants ("Wilkes and Liberty"), represent only a few of the major historical judicial corruptions of the 17th and 18th Century. Judicial corruption and/or mistakes, motivated by ignorance, avarice or the lust for power; were always seen to be an integrally inescapable part of anything man made. Thus, the VII Amendment's common law jury trial GUARANTEE! The idea that the founders thought to trade their hard won liberty from the "King that can do no wrong" for the discretion of any judicial officer of the court that "can do no wrong" is just RIDICULOUS. Beyond that the Jane Crow era, based on the Jim Crow and Juvenile Crow era's that proceeded it, it is currently decimating the roots of the American Family structure. MEN ARE DISFAVORED BY DOMESTIC RELATIONS LAW IN THE UNITED STATES OF AMERICA! The "Jane Crow" Era has been supported by media reports in the news for DECADES. "It doesn't take a cynic to point out that when a woman is getting a divorce, what she may truly fear is not violence, but losing the house or kids. Under an exparte order of protection, if she's willing to fib to the judge and say she is "in fear" of her children's father, she will get custody and money and probably the house." A fait accompli, "A man against whom a frivolous exparte order of protection has been brought starts to lose any power in his divorce proceeding. They do start decompensating, and they do start to have emotional issues, and they do start developing post-traumatic stress disorders (PTSD). They keep replaying in their minds the tape of what happened to them in court. It starts this whole vicious downward cycle. They've been embarrassed and shamed in front of their family and friends, unjustly, and they totally lose any sense of self-control and self-respect. They may indeed become verbally abusive. It's difficult for the court to see where that person was prior to the restraining order." "The Booming Domestic Violence Industry" - Massachusetts News, 08/02/99, By John Maguire, Hitting below the belt Monday, 10/25/99 12:00 ET, By Cathy Young, Salon - Divorced men claim discrimination by state courts, 09/07/99, By Erica Noonan, Associated Press, Dads to Sue for Discrimination, 08/24/99, By Amy Sinatra, ABCNEWS.com, The Federal Scheme to Destroy Father-Child Relationships, by Jake Morphonios, 02/13/08. Additionally, the "Jane Crow" era has NOW been sustained by socioeconomic statistical research. "Jane Crow" discrimination is verifiably REAL! 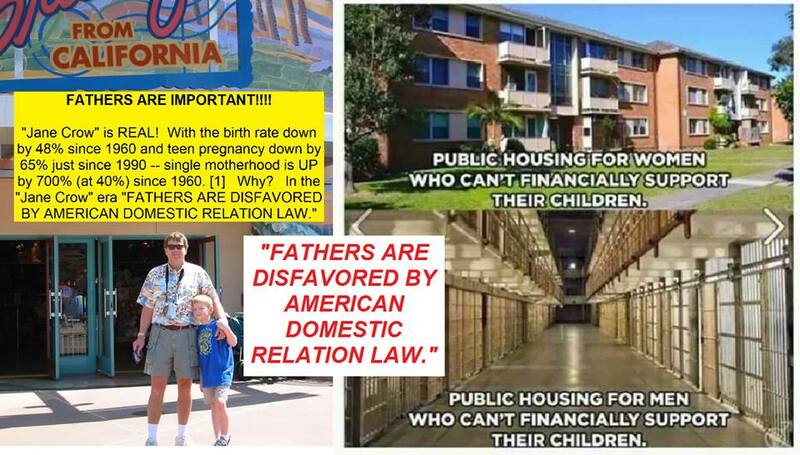 Men are disfavored by domestic relations law in the United States of America! With the birth rate down by 48% since 1960 and teen pregnancy down by 65% just since 1990 -- single motherhood is UP by 700% since 1960 (40% of births were to single mothers in 2015 v. 1960's 5%). Per the report's authors, these figures stand without regard to race or income. The place of the FATHER in the American Family is at RISK! First given that absolute immunity has been the unconstitutional fomenting force behind Jim Crow, Juvenile Crow and Jane Crow law it is time to END it HERE!! "I do not think that all judges, under all circumstances, no matter how outrageous their conduct, are immune from suit under 17 Stat. 13, 42 U.S.C. § 1983. The Court's ruling is not justified by the admitted need for a vigorous and independent judiciary, is not commanded by the common law doctrine of judicial immunity, and does not follow inexorably from our prior decisions" (MR. JUSTICE DOUGLAS, dissenting Pierson v. Ray, 386 U.S. 558 (1967)). Absolute immunity is not and never was authorized by the Constitution of the United States of America. Secondly the petition should be granted to, re-establish the XIV Amendment's "due process" and "equal protection" of the law for all persons and . Thus denying any and all "domestic relations exceptions." And once again, give reckonablity to establish the rule of law with the VII Amendment's jury trial, as proposed by the founders with the Constitution for the United States of America. Abolition of the Star Chamber - JULY 5, 1641 An act for the regulating of the privy council, and for taking away the court commonly called the star-chamber. Tennessee Supreme Court, Southwestern Reporter, Volume 4, May 16–August 1, 1887. 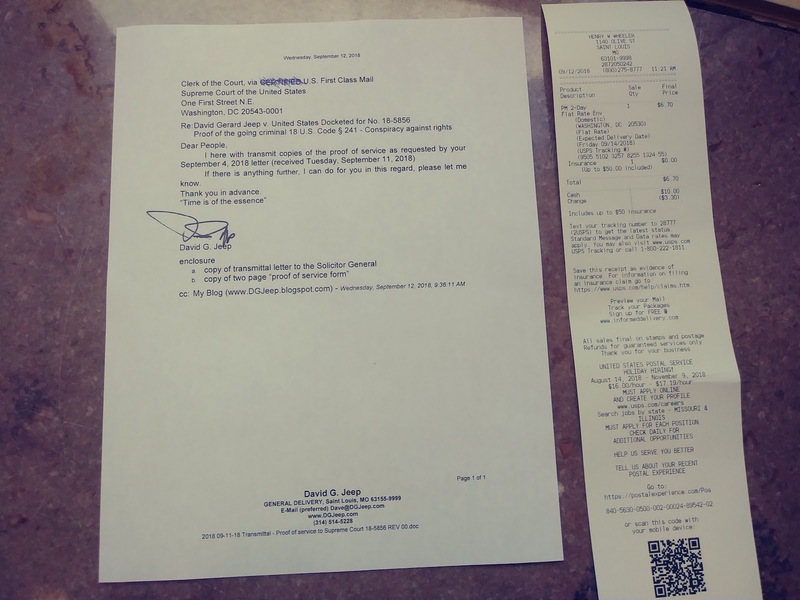 · Commissioner Philip E. Jones, Sr., Sharon G. Jeep (ex-wife), Kristen M. Capps (ex-stepdaughter), Joseph A. Goeke, Robert S. Cohen, Michael T. Jamison, Emmett M. O'Brien, Steven H. Goldman, Barbara W. Wallace (Presiding Judge in 2003), James R.
As you will see from the enclosed long trail of petitions - included by reference here, the fully executed application "MOTION FOR LEAVE TO PROCEED IN FORMA PAUPERIS" and the lower court grant of my in forma pauperis status I am impoverished. I am pro se. I am alone in the world without finances, in this 15 years struggle; I have lived in a homeless shelter for nearly 11 years. I do not have the capacity or the money to meet your stringent professional requirements for printing or duplicating my petition. I humbly ask that you accept the enclosed as my humble best effort possible. I have published a digital copy of this document on my blog but that is the best that I can do in my REDUCED CIRCUMSTANCES. If there is anything further, I can do for you in this regard, please let me know. a. "MOTION FOR LEAVE TO PROCEED IN FORMA PAUPERIS"
b. "Petition for Writ of Certiorari to the Supreme Court"
 I herewith note: 7 prior petitions on this issue in "PURSUIT OF JUSTICE," see Petition of Certioraris to the Supreme Court of the United States and associated District and Circuit petitions… 07-11115, 11-8211, 13-7030, 13-5193, 14-5551, 14-10088 and 15-8884.
 fraus omnia corrumpit - "Fraud corrupts all." - A principle according to which the discovery of fraud invalidates all aspects of a judicial decision or arbitral award. Rule 60(d)(3) of the Federal Rules of Civil Procedure - "set aside a judgment for fraud on the court"
 The assertion of a misdemeanor traffic violation does not provide REASONABLE probable cause for an ex parte order of protection. Clearly based on the original SERVED handwritten petition dated 11-03-03, there was a complete absence of jurisdiction for the stated charge. While the petitioner asserts this is not necessarily an isolated Jane Crow issue, it is a uniquely flagrant "first impression" and PERSONAL for the petitioner. Per McCabe v. Atchison, T. & S.F. Ry. Co., 235 U.S. 151 (1914) " The essence of the constitutional right to equal protection of the law is that it is a personal one, and does not depend upon the number of persons affected, and any individual who is denied by a common carrier, under authority of the state, a facility or convenience which is furnished to another under substantially the same circumstances may properly complain that his constitutional privilege has been invaded. "by reason of popular sentiment or secret organizations or prejudiced juries or bribed judges, [cannot] obtain the rights and privileges due an American citizen. . . .""
 Floyd and Barker. (1607) Easter Term, 5 James I - In the Court of Star Chamber. - First Published in the Reports, volume 12, page 23. Ida B. Well v. Chesapeake & Ohio Railroad - Tennessee Supreme Court, which reversed the lower court's ruling in 1887. It concluded, "We think it is evident that the purpose of the defendant in error was to harass with a view to this suit, and that her persistence was not in good faith to obtain a comfortable seat for the short ride. "[Southwestern Reporter, Volume 4, May 16–August 1, 1887. It should be noted, that the petitioner was found guilty of DWI. Although the petitioner contests this conviction too, with this petition. The conviction was a violation of petitioner's' constitutional rights i.e., "The rule of Brady v. Maryland, 373 U. S. 83, arguably applies in three quite different situations. Each involves the discovery, after trial, of information, which had been known to the prosecution but unknown to the defense." - United States v. Agurs, 427 U.S. 103 (1976). This can be documented, with the trial transcript and outside confirmation of standards, requested but never provided pretrial. See XIV Amendment Section 5. "The Congress shall have power to enforce, by appropriate legislation, the provisions of this article." The Enforcement Act of 1871 (17 Stat. 13), also known as the Civil Rights Act of 1871, Force Act of 1871, Ku Klux Klan Act, the act was passed by the 42nd United States Congress and signed into law by President Ulysses S. Grant on April 20, 1871. The act was the last of three Enforcement Acts passed by the United States Congress from 1870 to 1871 during the Reconstruction Era to combat attacks upon the suffrage rights of African Americans. The statute has been subject to only minor changes since then. "The congressional purpose seems to me to be clear. A condition of lawlessness existed in certain of the States under which people were being denied their civil rights. Congress intended to provide a remedy for the wrongs being perpetrated. And its members were not unaware that certain members of the judiciary were implicated in the state of affairs which the statute was intended to rectify. It was often noted that "[i]mmunity is given to crime, and the records of the public tribunals are searched in vain for any evidence of effective redress." Cong.Globe, 42d Cong., 1st Sess., 374. Mr. Rainey of South Carolina noted that "[T]he courts are in many instances under the control of those who are wholly inimical to the impartial administration of law and equity." Id. at 394." They took my son, everything I ever owned and threw me on the street to fend for myself! While the petitioner asserts this is not necessarily an isolated Jane Crow issue, it is a uniquely flagrant "first impression" and personal for the petitioner. Per McCabe v. Atchison, T. & S.F. Ry. Co., 235 U.S. 151 (1914) " The essence of the constitutional right to equal protection of the law is that it is a personal one, and does not depend upon the number of persons affected, and any individual who is denied by a common carrier, under authority of the state, a facility or convenience which is furnished to another under substantially the same circumstances may properly complain that his constitutional privilege has been invaded." Tennessee Supreme Court, which reversed the lower court's ruling in 1887. It concluded, "We think it is evident that the purpose of the defendant in error was to harass with a view to this suit, and that her persistence was not in good faith to obtain a comfortable seat for the short ride. "Southwestern Reporter, Volume 4, May 16–August 1, 1887. The "Jane Crow" era has NOW been sustained by socioeconomic statistical RESEARCH. "Jane Crow" discrimination is REAL! 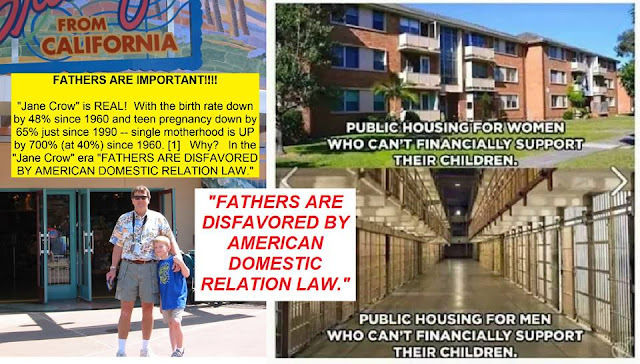 Men are disfavored by domestic relations law in the United States of America! With the birth rate down by 48% since 1960 and teen pregnancy down by 65% just since 1990 -- single motherhood is UP by 700% since 1960 (40% of births were to single mothers in 2015 v. 1960's 5%). Per the report's authors,these figures stand without regard to race or income. Abolition of the Star Chamber July 5, 1641 An act for the regulating of the privy council, and for taking away the court commonly called the star-chamber. My attorney of record filed two timely motions in December of 2003 addressing the constitutional issues in legal speak. "I do not think that all judges, under all circumstances, no matter how outrageous their conduct, are immune from suit under 17 Stat. 13, 42 U.S.C. § 1983. The Court's ruling is not justified by the admitted need for a vigorous and independent judiciary, is not commanded by the common law doctrine of judicial immunity, and does not follow inexorably from our prior decisions."